Alexander McQueen is a brand label with a lot of history and legacy. The label continues to deliver amazing fashion each season and has become a household name in the fashion industry. With celebrities like Lady GaGa advocating the brand, it’s sure to always be striking into the new and unusual with fashion. This Alexander McQueen look is a little different from the usual fair, but it is subtle with and striking in its own way. Let’s get started with the statement top – but where to start? 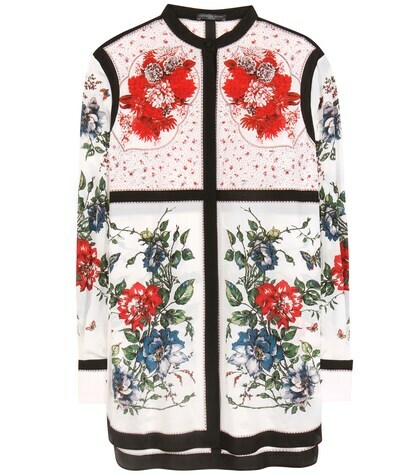 We simply adore this take on the traditional silk blouse with bright, yet balanced floral print. The bold lines help to break up the overall pattern and offers an almost deco artwork feeling. This helps to create a bold outline to the overall blouse that is echoed from the neckline to the cuffs. The blouse is tucked in on this look, however it is a full length top with pockets and a bold hem. This top could be worn for a variety of occasions, over chinos or leggings for a relaxed home look, or tucked in with tapered trousers for an office look. We love the flashes of bright red, a hint of spring and summer. With it being silk, you’ll be looking and feeling cool. 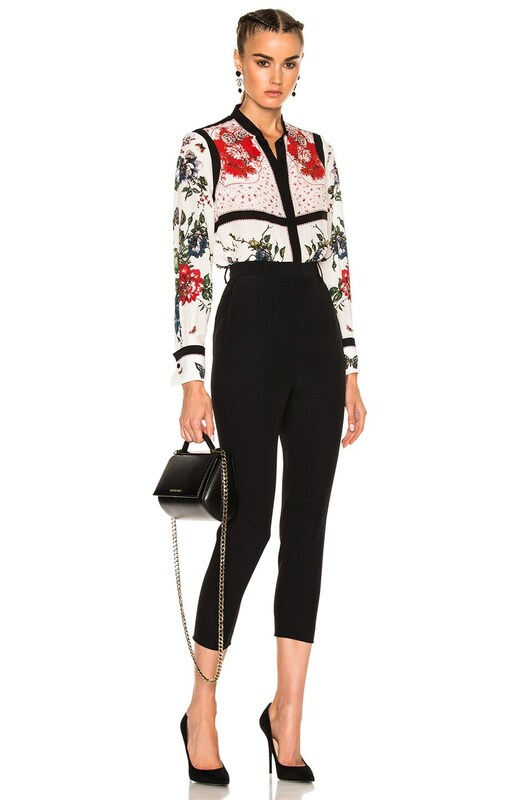 The high waisted trousers are a stunning take on the classic smart trousers. 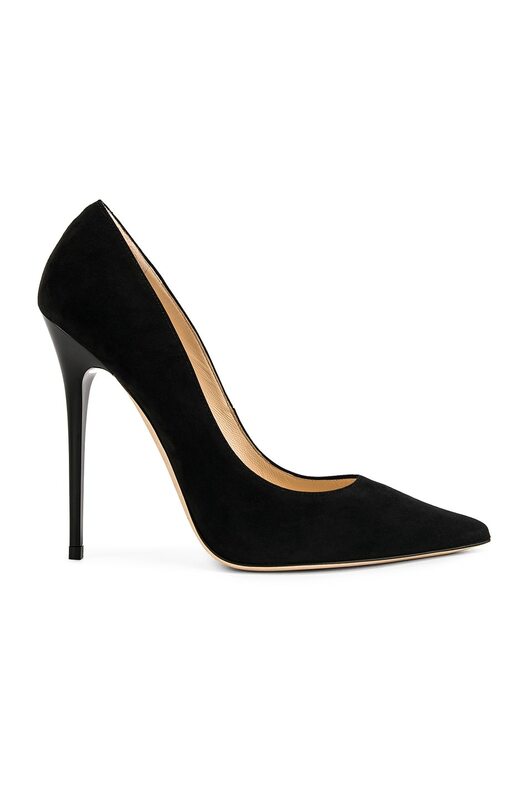 The tapered style and cropped length firmly place them in the here and now of fashion. Cropped trousers offer a chance to bare some leg after a long winter. These trousers are also perfect for the office without being too short or flared. A wardrobe staple of black means these cropped trousers are the perfect with a huge range of items, from cosy over sized sweaters to strappy tops or over-sized denim shirts. Now, the piece that pulls the whole outfit together (we often save the best for last!) is the handbag. 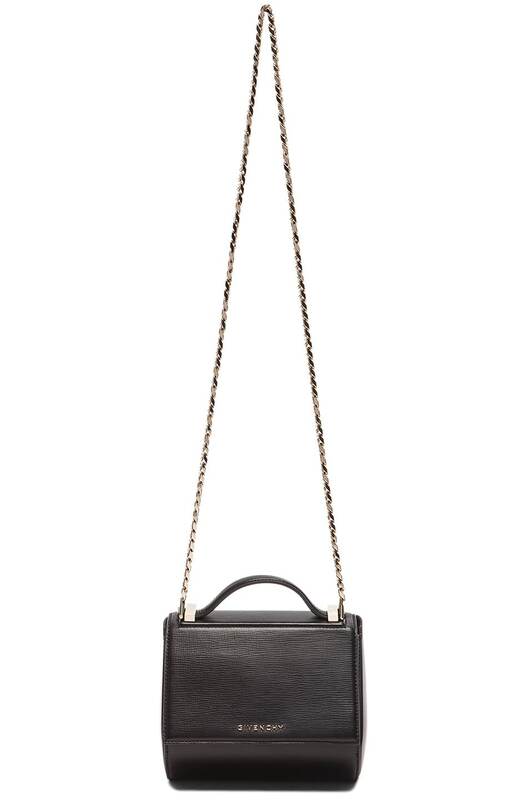 We think everyone should be rocking this style of box bag for this season. Not only is it a talking piece, it’s practical and can easily cope with your busy day in the office to a night on the town. The long chain gives an edgy, almost punk look which balances perfectly with the demure, spring look of the blouse. If you’re looking for a fresh, spring look, this is the one you need to go for!